Plus: The number of species of wild coffee that are at risk of extinction. 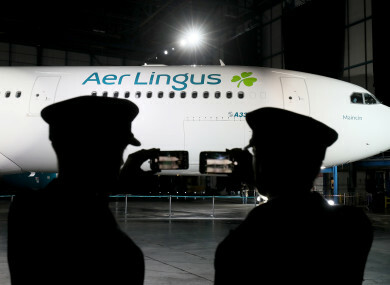 Pilots take photos of an Aer Lingus A330 displaying the new branding during the official unveiling at Dublin Airport. EVERY WEEK, TheJournal.ie offers a selection of statistics and numerical nuggets to help you digest the week that has just passed. €16.2 million: The amount of funding that has been allocated to Screen Ireland for 2019, up from €14.2 million in 2018. 50: The number of shamrock designs that Aer Lingus went through while concocting its new image. 3: The number of species of wild coffee that are at risk of extinction due to a deadly mix of climate change, disease and deforestation. 432: The number MPS - including over 100 from her own party- that voted against Theresa May’s Brexit deal. 1,500: The number of additional jobs that software giant Salesfore is to create following a significant investment that will see the creation of a new campus at the Dublin’s North Wall Quay. 19: The number of homes that Icare purchased to allow former homeowners to remain as tenants. The approved housing body purchases distressed mortgages from banks and allows the former owners to remain as tenants. 185: The number of bedrooms in the eight-storey hotel at Vicar Street in the Dublin Liberties that has been given the green light by Dublin City Council. 131: The number of Irish 18-year-olds that have been awarded free interrail passes to travel around Europe. 100,755: The number of used cars that were imported into Ireland in 2018, the overwhelming majority of which (95.8%) were imported from the UK. 80: The percentage of gardaí who are not trained to turn on a siren or drive in an emergency situation in the Dublin district. €995 million: The amount of money spent by Irish shoppers on groceries in December. The highest monthly total ever recorded in the Irish grocery market. 48 million: The number of likes that a picture of an egg received, making it the most liked post on Instagram. Email “How many shamrock designs did Aer Lingus go through to concoct its new image? It's the week in numbers”. Feedback on “How many shamrock designs did Aer Lingus go through to concoct its new image? It's the week in numbers”.